ESG Operations (ESG) in Augusta, Georgia is a contract company that handles municipal utility operations. Pretty much anything a city needs to do from a wastewater and water treatment utility standpoint, ESG is contracted to operate and maintain. 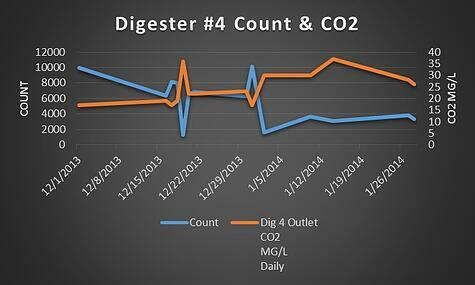 Methane production is becoming more prevalent in a variety of utility applications. Understanding the conditions and presence of this biology and optimizing anaerobic digestion at wastewater treatment plants has become increasingly relevant. The anaerobic digestion process occurs when organic materials in an enclosed vessel, kept at a constant temperature, are broken down by microorganisms in the absence of oxygen. This process produces a gas consisting of methane and carbon dioxide. At ESG, anaerobic methanogen microorganisms break down sewage sludge and wastewater solids to produce methane that can be used to produce electricity and heat. The effectiveness of this anaerobic digestion process is determined by the methanogen population. Methane formers are very delicate organisms and they’re susceptible to dying off if you change their environment too much, so they need to be in a tightly controlled environment. 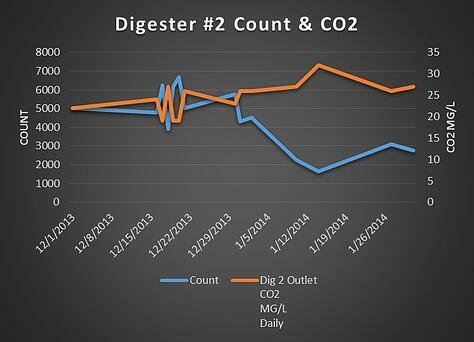 Keeping your population healthy is key if you want to optimize anaerobic digestion. Percy Nolan is a project manager at ESG. He acquired the use of a FlowCAM® dynamic imaging particle analysis system as part of a partnership / collaboration program with Fluid Imaging Technologies. One of the things that Nolan and his team theorized when using the instrument was that there was a correlation with methane production and the presence of methanogens in their anaerobic digestion process. They knew that a specific species of bacteria, Archaea, produced methane. They also knew about what size they were and they knew their shape. They felt that if they could easily see the particles and identify the shapes using the FlowCAM, a correlation with microorganisms may emerge. Then they might be on to something. Bacilli-shaped microorganisms (above) and grit (below) samples as imaged on the FlowCAM used at the Augusta, Georgia Treatment Plant. Nolan and his team analyzed samples to determine particle shape. They found some that were the rod-shaped bacillus they believed to be Archaea particles. With its VisualSpreadsheet® software, the FlowCAM can record over 30 different measurements per particle and can capture particle images at up to 22 frames per second allowing for high sampling efficiency and fast analysis times. It sorts and filters particle data and immediately displays all similar-type particles. The data they collected with the FlowCAM trended very closely to some of the performance parameters that they normally test for in their analytic digestion strains. “It was pretty exciting to see the characteristics and the fact that the particles trended so similarly,” said Nolan. Nolan and his team found there was definitely some correlation between the bacilli-shaped microorganism images they were seeing with the FlowCAM and what was going on in their digesters. However, more in-depth testing would need to happen over a period of time in order to verify that what they had found was, in fact, an Archaea organism that produces methane. “I feel like we were able to hypothesize in a very short, abbreviated kind of study that we were correlating something to our performance criteria that normally trends in that process,” said Nolan. Increases in volatile solids reductions correlated to increases in image densities and decreases in CO2 levels. CH4 was not sampled as part of this study, so it was postulated that the decrease in CO2 would be indicative of an increase in CH4 levels. The correlations were surprisingly acute as it pertained to CO2 levels. The trend graphs below demonstrate these findings. The main focus at ESG is to reduce the solids amount as much as they can through digestion. 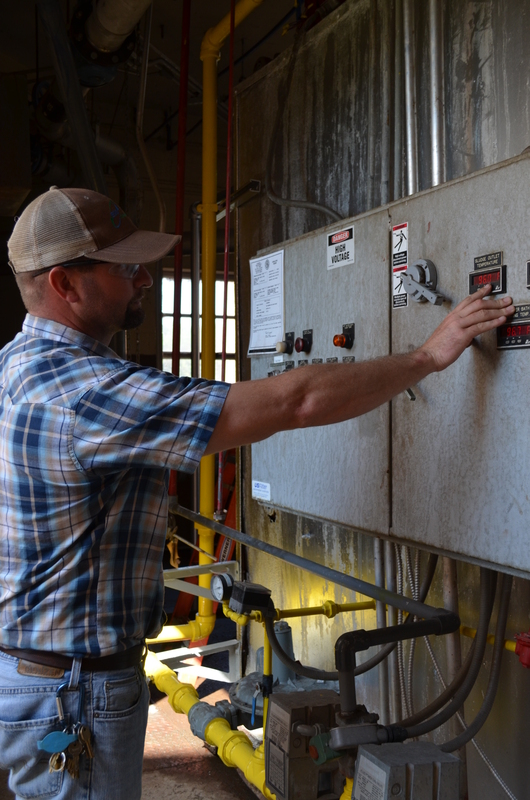 But Nolan recognizes the benefit of an application of a co-generation system where these microorganisms could be producing enough methane to power a generator for other processors in the plant. “It would require running your digestion train in series, not in parallel in order for it to be useful – which is what we happen to do here,” said Nolan. If ESG had a FlowCAM in place, they could get better process performance. If the bacilli-shaped microorganisms turned out to be a methanogen population, they could predict with some reliability what they're going to be able to produce for gases and subsequently estimate how much natural gas consumption was required to supplement other equipment processes. When people are designing co-generation systems, the big unknown is how much gas can be produced and how well can it be captured. For example, if it could be determined that Archaea was found, the FlowCAM would provide data on population counts. "Through more in-depth research we would know if we have, say, 20 million of these microorganisms per milliliter, then that equates to some quantity of natural gas or methane," said Nolan. The speed at which ESG could get information on potential methanogen populations would be another benefit of using the FlowCAM. If the microorganisms could be genetically identified correctly and established in real time, it has the potential to save millions in digester process control at the plant. If the FlowCAM can be used as an assessment tool for correct identification of methanogen populations, the instrument could play a major role in helping to define further design and implementation of a co-generation system and possibly save millions at ESG. Future studies need to be conducted to confirm the biology of the bacilli-shaped microorganism images captured with the instrument at ESG, but it's the basic morphology and the frequency of testing available through FlowCAM image analysis that enables effective population dynamic studies to be possible. If successful, using this method of optimize anaerobic sludge digestion could not only save money for plants, it could also help improve energy efficiency in wastewater treatment plants. Are you ready to experience the FlowCAM difference, and see how dynamic imaging particle analysis can help improve particle analysis throughout your wastewater treatment plant? Then try our free sample analysis! In addition to activated sludge morphology characterization, the FlowCAM is a useful tool for grit characterization, floc characterization, and identification and enumeration of microscopic organisms. Simply send us a sample, and we'll analyze it in our particle analysis laboratory at no cost to you.